Afternoon tea is very much an English institution, and something the 21st Century Husband and Teenager really enjoy. Ok, I have to admit, I love it too! So even when we are abroad, we enjoy finding somewhere to take tea. Of course, this is not something we do every day as it is extremely hazardous to your waistline - as you can see from the photograph above! The French don’t officially take tea in the afternoon the way the English do, but if you visit a French cafe or restaurant around four o’clock, you will often see people requesting a table for “un petit dessert” which they have with a cup of tea or coffee. So we English really are not that different from the French in that respect at all. One of the best places in Paris to take afternoon tea but still stay true to French ambiance is the wonderful Le Fouquet’s on the Champs Elysées. The 21st Century Husband introduced me to it some time ago, and we try to make at least one visit there every time we are in Paris. Le Fouquets has been an institution since 1899 and its iconic red awning has welcomed everyone from Churchill and Chaplin to Jackie Onassis and Theodore Roosevelt. Of course, Le Fouquets serves wonderful full meals, but if you arrive at the right time in the afternoon, they will happily serve you coffee or tea and “un petit dessert”. The selection of “petit desserts” is quite staggering and they are anything but petit in most cases. The most famous of these is their Fouquet’s Millefeuille, a chunky tower of crisp pastry layers sandwiched together with thick layers of creme patisserie and served with a raspberry coulis. As well as tea or coffee, Le Fouquets makes wicked hot chocolate that is really almost like liquid chocolate melted in a cup. 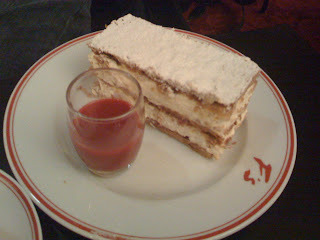 As if this were not sinful enough, the Viennese version of this treat even comes with cream! 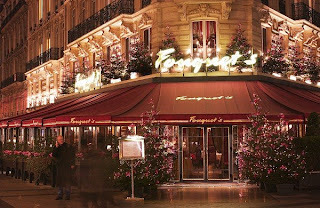 Le Fouquet’s is beautiful, with luxurious red decor and plush red and gold curtains. Photographs of the celebrities and statesmen who have visited line the walls and the atmosphere is one of relaxed and cheerful elegance. Comfortable booths are available, and some of the tables even have sofas for seats. There is a formal dining room on the second floor. Le Fouquet’s is so famous that this thriving restaurant has been designated an official Monument Historique, and it is still popular with celebrities. However, the staff are so discreet and the seating arrangements so intimate you would be hard pressed to spot one of them. Furthermore, in my experience you are treated politely and made to feel special whether your photograph would be welcomed on Le Fouquet’s wall or not. In the fine weather, if you don’t mind being seen, you can even sit at one of their highly coveted tables outside on the Champs Elysées watching the world go by. It’s definitely a treat with tea for three coming in at nearly 76 Euro (that’s about £74 or US$97 at today’s exchange rate) but it is such fun and so delicious I highly recommend it. Le Fouquet’s is proof positive that although our cultures are quite different, both the French and English have to agree that there is nothing like a nice cup of tea alongside something delicious to perk you up in the late afternoon. And if we can agree on that, I’m pretty sure we can agree on almost anything! To Do or Not To Do? That is the Question.